Enlite Dry Cleaner is the only Point of Sales software you need to run your dry cleaning business. From drop-off to pickup or delivery Enlite POS has everything you need to deliver dependable top notch service to your customers. Delight is a Point of Sales software solution for your restaurant. Streamline and facilitate your operation from reservation to bill with Delight POS’s powerful features and tools. DeliDelight is a Point of Sales software solution tailored for the needs of Delis, coffee Shops, pastry shops and similar food service establishments. Not all restaurants have the same needs and DeliDelight POS is built for you. Retail POS is a flexible and powerful Point of Sales software for a variety of retail environments. Grocery stores, clothing outlets, gift shops, etc. Retail POS delivers exceptional performance while adapting to the way you do business. ScanQ proudly offers some of the most aggressive pricing in the market. Select products even carry a price match guarantee so that our clients always receive an exceptional value. ScanQ has 23 years of experience delivering targeted Point of Sale software and support to our valued clients. POS software should never be a one-size fits all solution; every industry has specific requirements of their Point of Sale software. For this reason ScanQ has built its reputation on creating POS software that is targeted to specific industries so we can better meet the needs of those clients. One of our most popular products is our Dry Cleaner Point of Sale software, Enlite. Selecting a Point of Sale software solution is no easy task. The right POS software can make or break an operation, so it’s critical that in addition to a quality POS solution, you get the support you need to make it work for you. All of our Point of Sale software solutions carry with them our world class support. Don’t want to look up the answer in a manual or forum? Not a problem, gives a call and we will connect to your computer and solve the issue for you. Finally, a Dry Cleaner POS built specifically for Dry Cleaners. 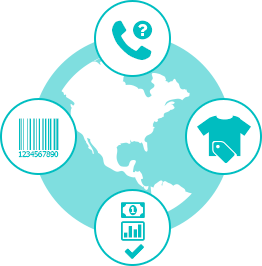 Find out more about how our Dry Cleaner Point of Sale software can take your business to the next level. Enlite Dry Cleaner POS also offers a free trial. Put our Dry Cleaner POS to the test and find out why so many Dry Cleaners are moving to Enlite Dry Cleaner Point of Sale software. ScanQ is a multi-cultural company that offers services and technical support in many languages such as English, Spanish, Persian, and Korean. We are based in Alpharetta, Georgia and have offices in Miami, Florida and Venezuela. We offer several technical support options, by phone, online, and on site to help you. We at ScanQ are confident in our ability to provide premier service at the most affordable price on the market, thus we provide a lowest price guarantee with a 10% price match on all of our complete POS systems. We are committed to see your business succeed!. Thank you for choosing to try ScanQ products. We're certain you wll be delighted with our software. Please select the desired software below to register for your download.